Folks, this is a pretty classy dessert. 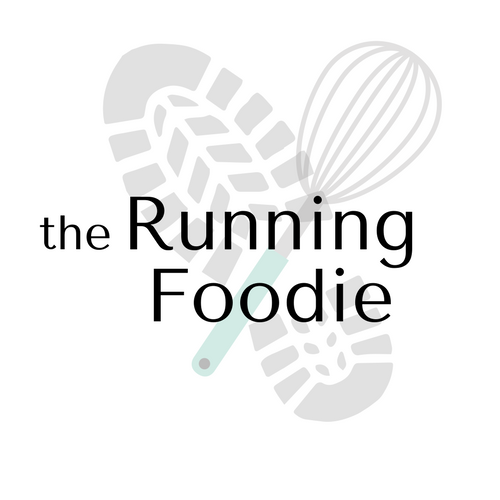 My blog isn't really fine dining, like Becky Reams', and usually when I make fancy meals they rarely get photographed since I cook them to eat, which means they're not timed around when the natural light at its best. Desserts are easier to photograph for that very reason. There are no step-by-step photographs for this recipe since I was under a bit of a time crunch, and the cheesecake portion was prepared when there was no daylight left. But it's so easy, it's not needed. It's kind of weird to even have cheesecake on my blog, as most make my mouth claustrophobic - it's all thick and dense and blah. But this isn't a normal cheesecake, this is a no-bake cheesecake, made in separate components and assembled just before being served. The best part is that you don't need individual cheesecake pans or rings, just ramekins. Texture-wise, it reminds me more of a mousse. It's deceptively rich, so you could divide the mixture between eight 4-ounce ramekins, if you so desire. When I set out to make this dessert, I knew I couldn't just use cream cheese. It's fine thinly spread on bagels, but that's about all I will tolerate of that. 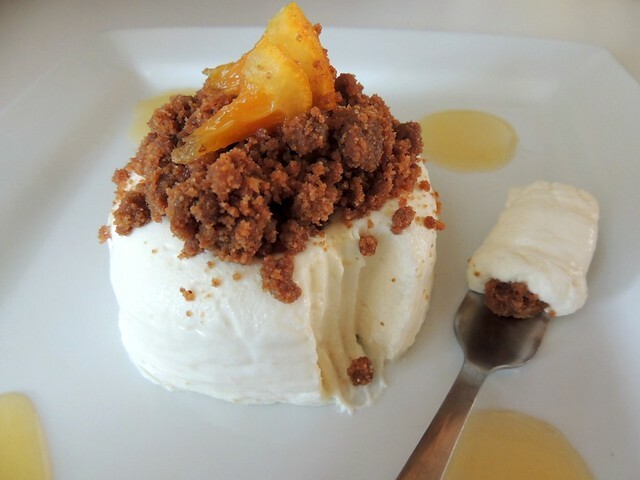 Mascarpone was my first and only choice. The two of those are mixed together with Valencia orange zest and juice, and sweetened just enough to make the citrus flavor pop. You could add about half a teaspoon of vanilla extract or the equivalent of a vanilla bean to round it out. Honesty time. I had originally wanted to use blood oranges, but I couldn't find any at the store. Confession. I've never tasted a blood orange, but I'm sure they're good. Also, they're prettier, and if your store has them I would suggest that you use those instead. For the crumb topping, I was inspired by a Gordon Ramsay recipe (for a similar no-bake cheesecake, only his was in grams and no way was I going to convert, and besides, his didn't have mascarpone) where you make a caramel and toss the crumbs in it. Since my cheesecake mousse part wasn't too sweet, the gingersnaps added a nice texture contrast as well as an additional sweetness and spiciness. It's amazing. Finally, there is the candied orange garnish. You could skip this, but you'd be missing out. 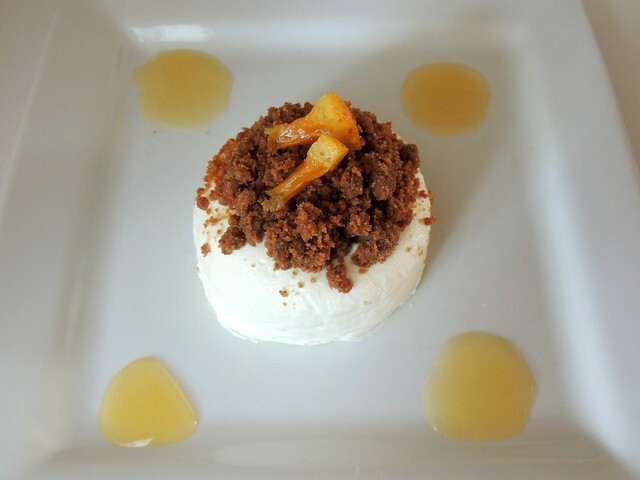 That little burst of citrus and chew tied it all together, and it makes the dessert look beautiful on the plate. Even though this fairly simple recipe is labor intensive due to the three different steps, all of them can be prepared in advance, which pretty much makes this the best dessert ever. The moussecake (that does not sound or look right, at all) is light and fluffy, and the crumbs are caramely and spicy. If you're in need of a spectacular dessert, or just a banging holiday treat, I urge you to give it a go. 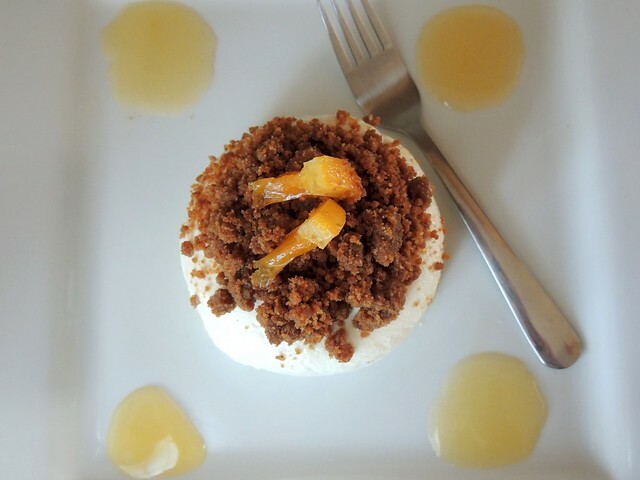 This light and fluffy no bake cheesecake, flavored with orange and topped with spicy caramelized gingersnap crumbles, is the perfect dessert for the upcoming holiday season. Prepare four 8-ounce ramekins by lining with a large square of plastic wrap. Set aside. Mix cream cheese, mascarpone cheese, 1/2 cup confectioner's sugar, zest and juice, and kosher salt in a small bowl until smooth. In medium bowl, whisk heavy whipping cream just until stiff peaks form. Stir 1/3 whipped cream into cheese mixture to lighten. Scrape lightened cheese mixture into bowl of whipped cream and gently fold just until combined. Divide evenly between prepared ramekins; cover with overhanging plastic wrap and refrigerate overnight. Slice two 1/4 inch slices from one of the oranges. Juice the remaining oranges - add extra water to make 1 cup. In a 2 quart saucepan, add juice and sugar. Bring to a boil over medium heat, stirring to combine sugar with liquid. Let boil for 5 minutes. Add both orange slices and continue boiling for 10 minutes, reducing heat if boiling too much (you're looking for a gentle boil). After 10 minutes, turn orange slices over and continue cooking for another 10 minutes. Turn orange slices out onto a parchment lined plate. Place in the refrigerator to cool. Pour syrup into container and set aside. Pour sugar in a 2 quart saucepan. Over medium heat, cook until sugar turns amber, about 5-10 minutes, stirring if necessary. 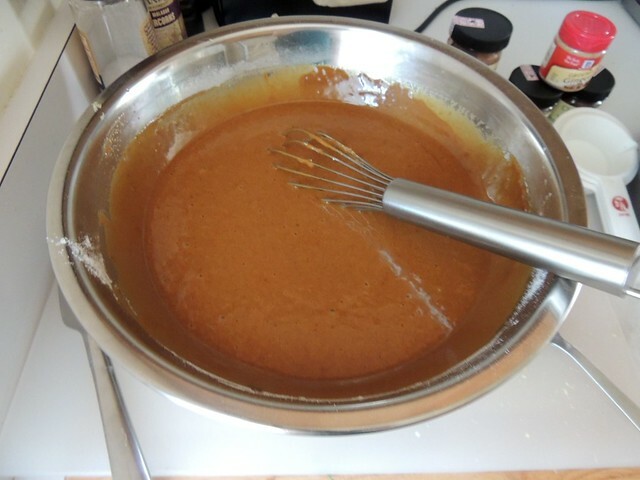 Carefully add butter, 1 tablespoon at a time, whisking to combine with caramel. After all the butter is added, pour in gingersnap crumbs and stir to combine. Lower heat to medium low and stir crumbs until the mixture feels sandy, about 3-5 minutes. 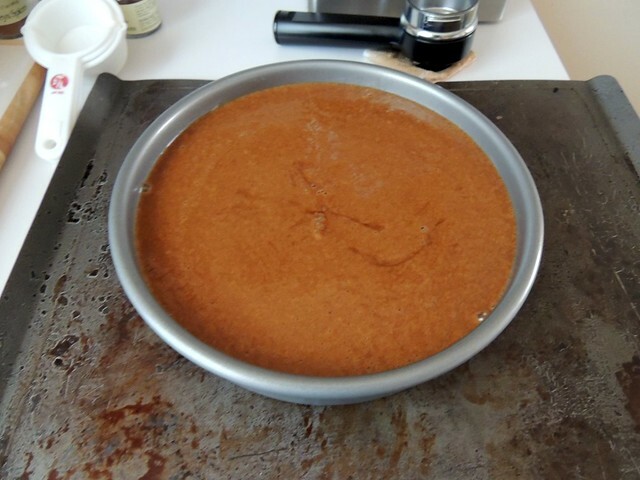 Pour out onto a parchment lined plate and refrigerate to harden. Unwrap tops of cheesecake. Place plate over ramekin and turn over. Thump bottoms of ramekins and gently pull up (if cheesecake won't release, carefully tug plastic wrap down). Break up gingersnap crumbs with a fork. Carefully top each cheesecake with 1/4 cup crumbs, pressing gently to adhere. Slice candied oranges into quarters, and each quarter into halves. Place two pieces on top of the crumbs. To garnish plate, carefully dollop syrup around cheesecake (reheat syrup for 15 seconds if necessary). Let's pretend it's Friday, you're hungry and in need of dinner. You don't necessarily want to go out to eat, but you would like to have a tasty meal with your "significant other". (You're probably asking me what kind of boring person would prefer to stay in than go out -- all I can say is, eating out can be kinda stressful and expensive.) Your choices are to either order takeout, or seek out a tasty meal from the grocery store. Usually when I opt for the latter, I look for food that can be prepared quickly and still tastes good. 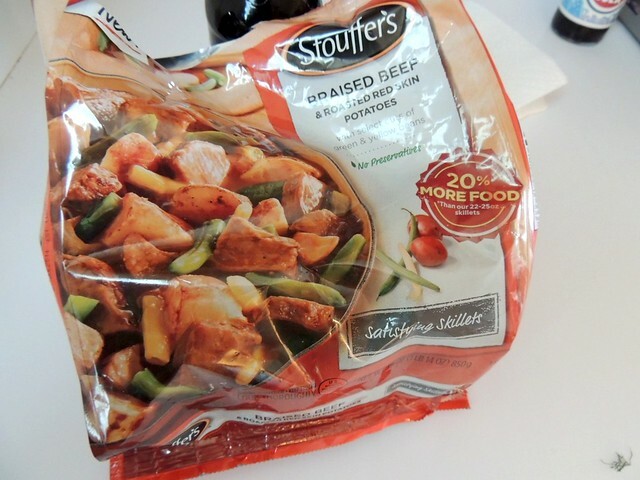 That is how I envisioned Stouffer's Satisfying Skillets playing in to one of my weekday meals. I set out to Walmart in search of the item - which terrified me because I hadn't been to that part of town before and I was driving a manual. 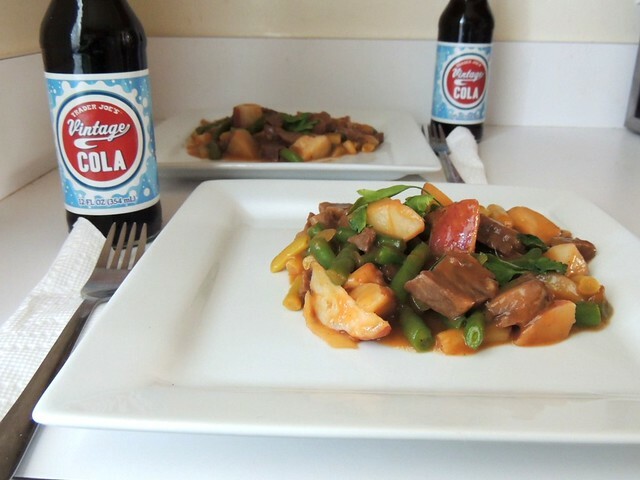 Stouffer's Satisfying Skillets is a new line of preservative-free frozen meals. 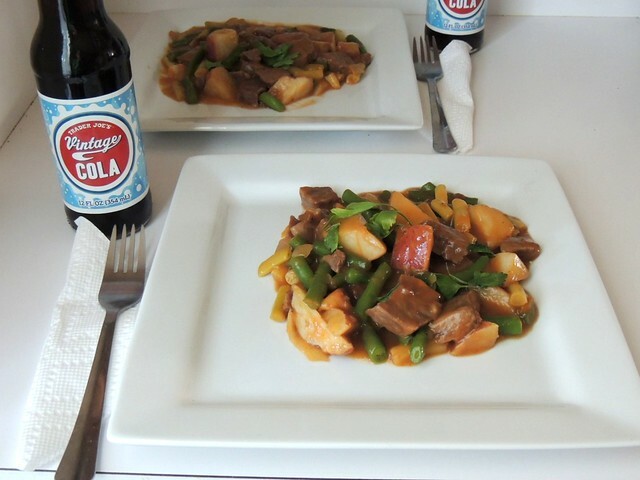 Although these meals contain 20% more than some of Stouffer's other meals, it's really only enough for two servings - perfect for an impromptu date night. Thankfully, I made it to and from Walmart and the frozen food aisle safely and was able to locate the food. From the flavors available, I chose the braised beef & roasted red potatoes which also contain "select" cuts of green and yellow beans. Inside the bag, there are what appear to be chunks of carrots, but I realized those were the sauce pellets that form the creamy gravy. Since I haven't had pot roast or stew in a long time and because the weather is beginning to cool, the heartiness of this meal (I'm all about the beef!) appealed to me the most. The meal takes just 20 minutes to cook and doesn't require any additional ingredients (except for oil). 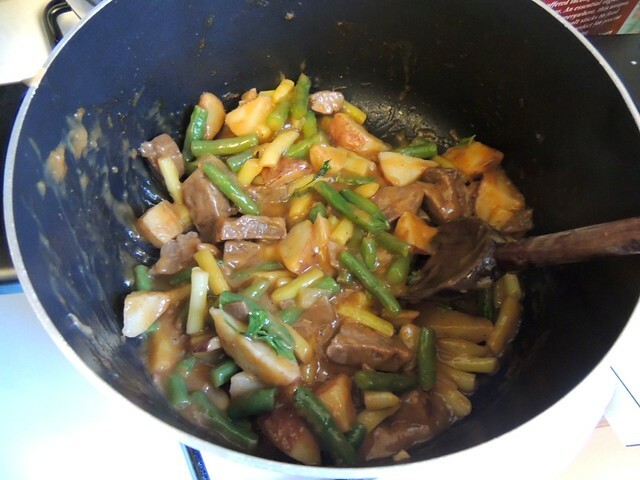 The vegetables are very crisp, the potatoes aren't mealy, and the chunks of beef are heartier than I expected it to be. Typically, pre-made, frozen meals are very salty, but I felt that this was very evenly flavored. If I made this again, I would pair the meal with an additional starch, such as egg noodles or garlic bread. It wasn't entirely filling on its own, though it is an excellent platform for a quick dinner, especially at $5.98. To see my trip to Walmart, take a look at my Google+ album. I suppose gingerbread is more of a winter flavor, but I'm just not feeling pumpkin this season. My obligatory taste of pumpkin this year was in the form of a latte, and maybe I'll bake a pumpkin roll eventually. Don't feel too bad for me, though, because this cake is incredible! It was baked last Friday and I'm still working my way through it, one slice for breakfast at a time. This recipe is from a culinary memoir I bought a year or two ago, Under the Table: Saucy Tales from Culinary School . Most of the recipes in it are kinda fancy, though there are a few easier recipes like biscuits and this cake. You probably have all the ingredients to make this right now. I had to buy molasses, and I didn't have allspice, but cardamom makes a good substitute. 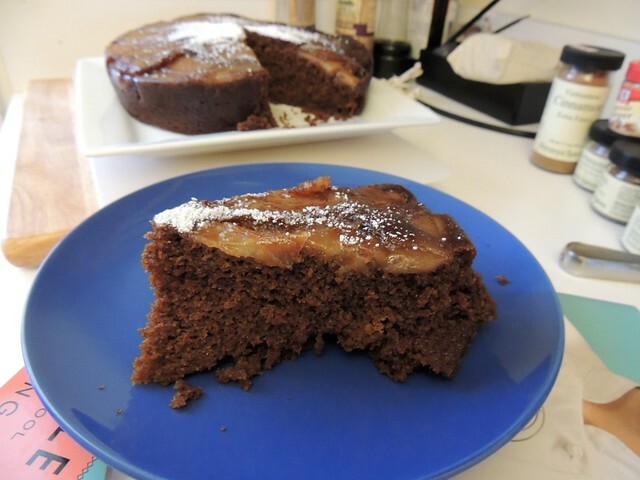 Recently, I bought new cake pans and this is the first cake I baked in it. I bought a baking sheet from Chicago Metallic a few months ago since the baking sheet I was given from the lentil contest is really good. 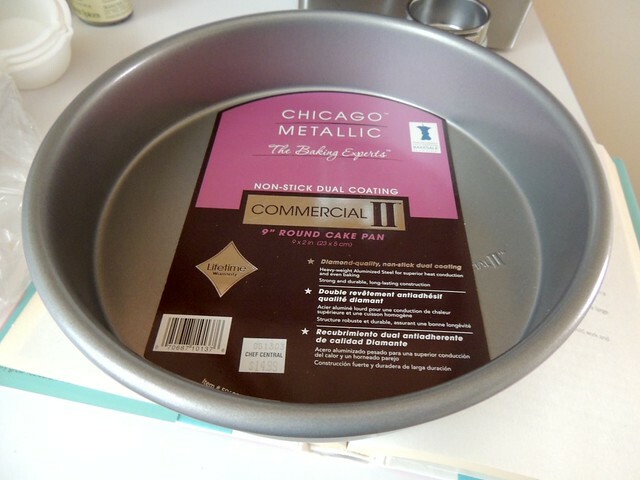 Because I like matching things, I bought cake pans from the same company: Chicago Metallic Commercial II Non-Stick 9-Inch Round Cake Pan . I didn't mean to buy nonstick, as the uncoated pans are a few bucks cheaper, but that's all that was available at Chef Central (I had a LivingSocial deal). That ended up working out in my favor, though. The pans are a little heavy, but very sturdy. The thick rolled rims make the pan easy to grip with oven mitts. 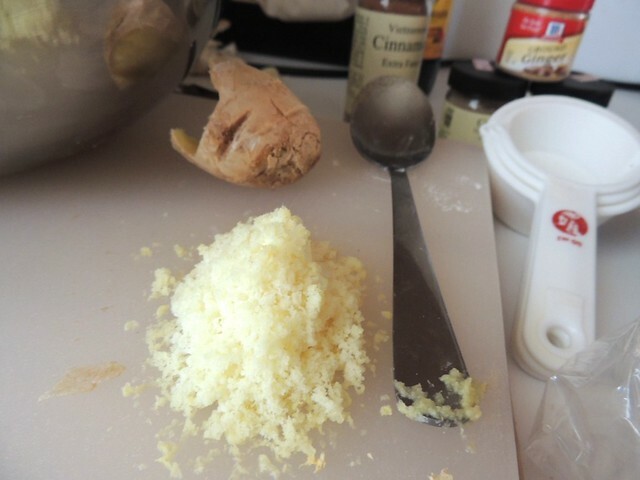 To pack a spicy punch, both powdered and freshly grated ginger are used in the batter. If you use a microplane zester, there is no need to peel the ginger before grating it. Love that! 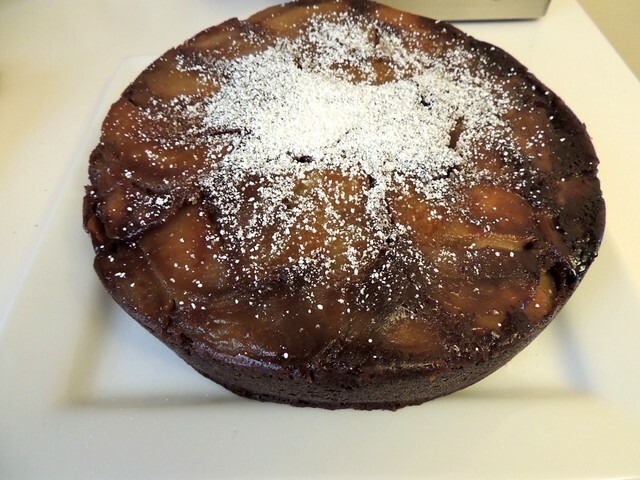 Apple slices, which are precooked in butter and brown sugar, are placed on the bottom of the cake pan. 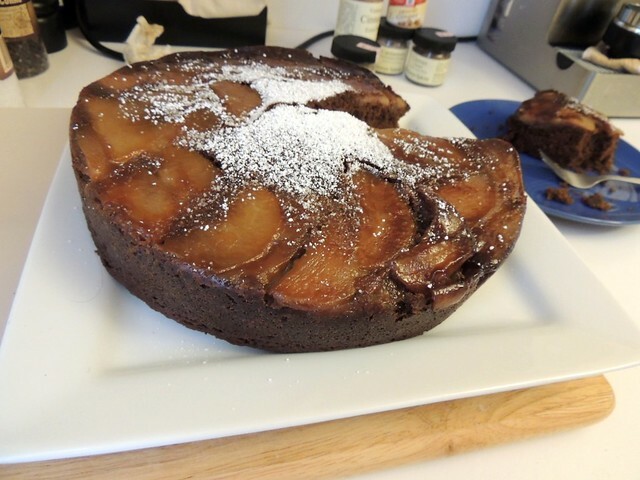 This cake baked up really well! It is tall, moist, and spicy. The apples are almost like a thin coating of jam, which tickled me to the core. I am also now in the mood for all things fall (but not pumpkin) - I have returned to knitting (the knitting group I attended helped), I am eagerly awaiting the first real drop in temperature so I can wear my new boots, and I can't wait to break out my scarves (and buy a few more from NYC vendors). And that nonstick pan I didn't mean to buy? It was pretty effortless to clean! To prepare the apple bottom: In a saucepan over low heat, stir together the butter and brown sugar until the butter melts. 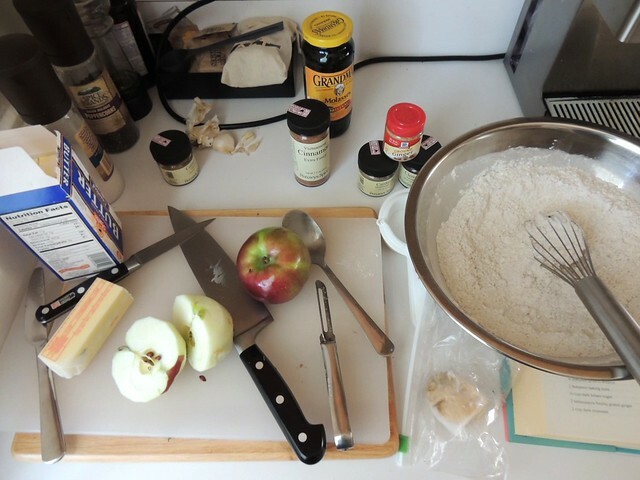 Add the apples and cook gently until the apples soften and caramelize slightly but still retain their shape, about 15 minutes. Remove from the heat. To make the gingerbread: Preheat the oven to 325°F. 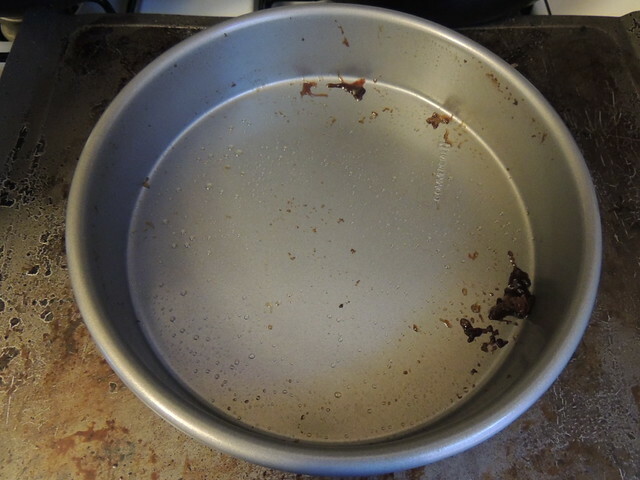 Thoroughly grease a 9-inch round cake pan or ovenproof glass baking dish. In a large bowl, combine the flour, ground ginger, cinnamon, cloves, allspice, baking soda, and brown sugar. Stir in the grated ginger and molasses, then the egg. Once the egg has been fully incorporated, add the hot water and oil. Mix gently until everything is well combined. 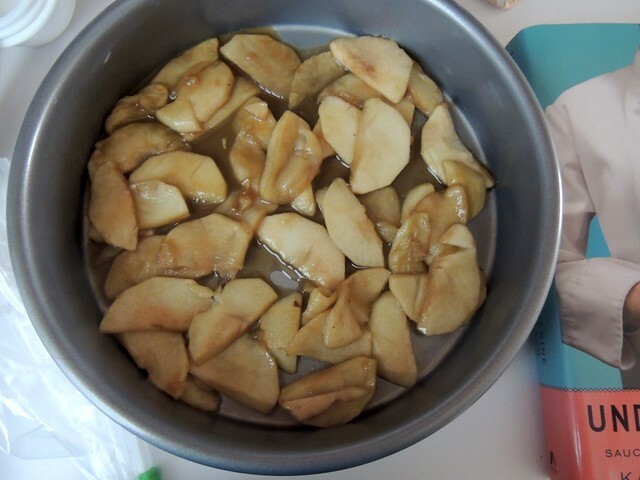 Spread the apples and their caramel in one layer in the prepared pan. Gently pour in the gingerbread batter. Bake for 45 minutes to 1 hour. 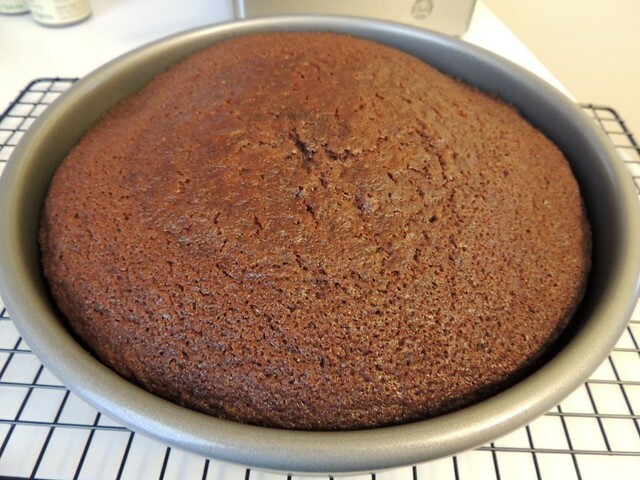 The gingerbread is fully baked when a toothpick comes out clean and the cake begins to pull away from the side of the pan. Let cool in the pan for 5 minutes and then invert the pan onto a large plate or platter. Everything should come out beautifully.